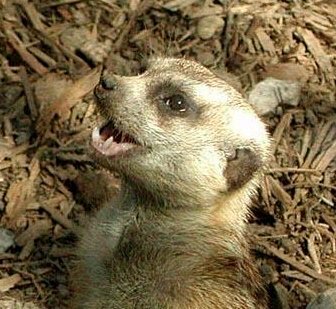 General information: Meerkats are small mammals who are most closely related to the mongooses. They are colonial animals, so they are very social within their own group. Behaviors that make this evident are that they will share food, and groom, snuggle and lick each other often, as well as before settling down to sleep in a large pile similar to canine puppies. Meerkats form groups in order to survive. Being such small animals, they are very susceptible to larger predators. However, when they are part of a larger group, there is a division of labor, a sharing of resources, and greater strength in numbers. 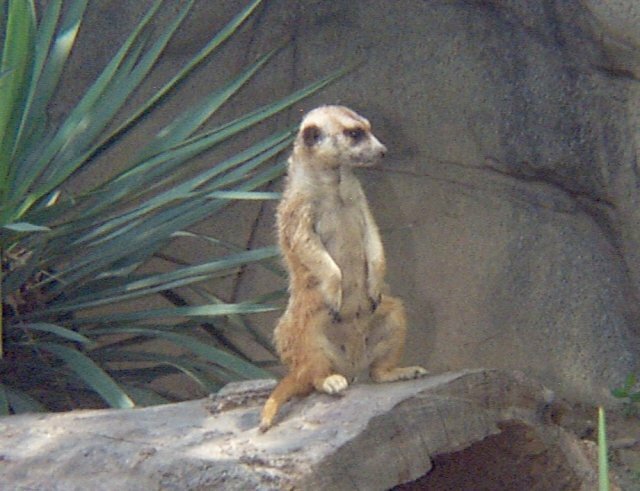 Meerkats perform specific roles, hence the division of labor. The members of the group specialize in one of these specific roles, such as guard duty, babysitting the young, foraging, and sharing food. 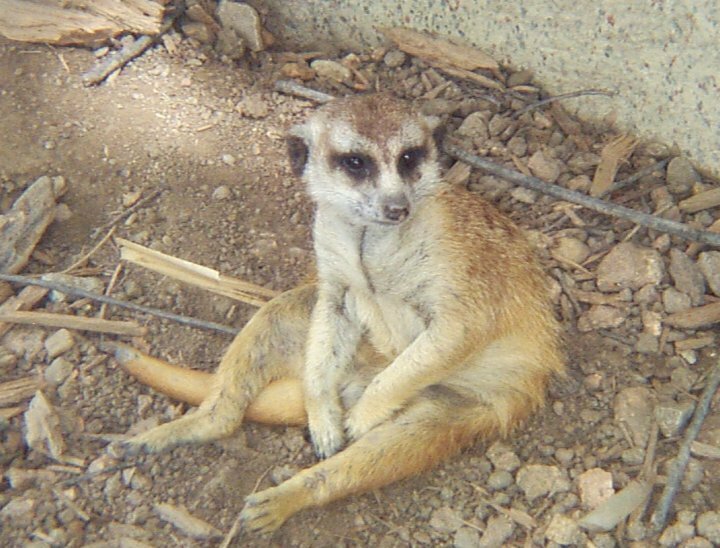 Even though each member has his or her own job, the meerkats are relieved of their duties by others so that they can eat. Each takes a turn at babysitting and guard duty for short periods of time. These duties are exhausting, and the willingness to share the labor displays the cohesion of the group. As seen by their sleeping arrangements, the meerkats are a closely knit group. This closeness is evident in the daytime as well. During the day, the meerkats forage for food out in the open savannah. This could be dangerous, but each member of the group takes a turn at guard duty by pausing briefly to stand erect and scan the skies for pedators. At other times, one of the meerkats who has specialized in guard duty will perch as high as 12 feet on a branch to watch the skies. His constant peeping lets the group know that the skies are clear. When one guard is relieved by the other, he is very hungry. This is due to the fact that meerkats are used to eating every few minutes. At each step they paw and sniff the ground until they smell food. They then begin a digging frenzy, sending the sand flying, until they capture the prey. They can move their own weight in sand in a matter of seconds, which is important when their dinner is running away. The sand also flies when the meerkats use their specialized claws to dig burrows. These burrows are extensive passages that can cover many underground miles. They are used for sleeping, escaping from predators and the hot sun, and raising their kits to maturity. Although meerkats are very social within their own group, they are very intent upon driving away intruders. They will either group together when threatened to form what appears to be a giant, hissing animal, or they will fiercely drive another group of meerkats out of their territory. This second behavior is done by performing a type off "war dance" that consists of each meerkat jumping higher and higher in the air and jeering loudly. They progressively move forward, then suddenly stop and start vigorously pawing the ground. This action causes what looks like smoke signals to rise into the air. The war dance and smoke signals are the meerkat's way of intimidating outsiders by making themselves appear stronger and more numerous. The victorous group will then mark the losing group's territory with their waste. Special anatomical, physiological or behavioral adaptations: Meerkats have developed an immunity to scorpion stings that can paralyze a grown man or kill a small child. They also have black patches of fur around their eyes that function as a sort of built in pair of sunglasses. The meerkats live in groups instead of singly. This provides a better chance for survival due to the greater protection of the group, a sharing of resources, and a division of labor. One particular job a meerkat can do is to teach the young how to hunt. This is accomplished by the meerkat running around the kits with a tasty insect in her mouth and trying to get the kits to take it away from her. Another behavioral adaptation related to group survival is banding together to form what appears to be a giant, hissing animal, as was mentioned previously. 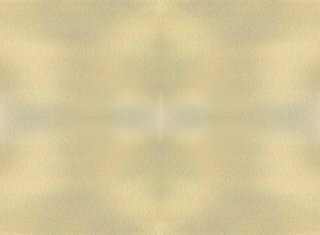 This is achieved by grouping tightly together, fluffing up their fur, and surging forward with their teeth bared and tails held high. Research biologist David W. Macdonald of Oxford University reported seeing this behavior. The meerkats drove off a much larger jackal and a bat-eared fox who had invaded their territory in this manner. 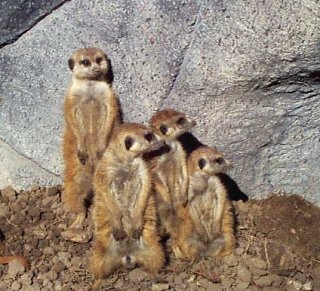 Personal observations: When the Meerkat Mounds exhibit first opened up in 1997, there were many babies among the population. The babies are extremely small and cute. They are also watched very closely by the adult meerkats. Even in the somewhat safe environment of the zoo, the adults are constantly raising up on their hind legs to keep watch for predators. However, now that the babies are grown, the meerkats seem to be more relaxed. There is one definite guard, and the rest of the group seems relatively unconcerned with the zoo patrons. They eat, play, and sun themselves without a worry. 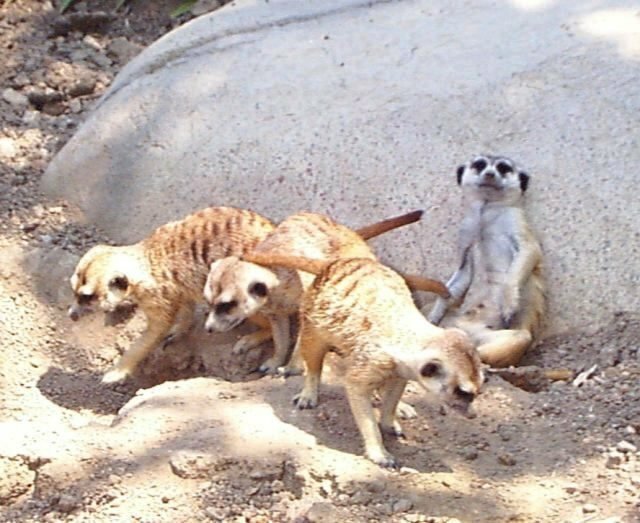 When the meerkats are not busy eating, playing, and warming themselves in the sun, they enjoy watching the zoo patrons. They are very curious and will focus on one particular person, who they will seem to "study". 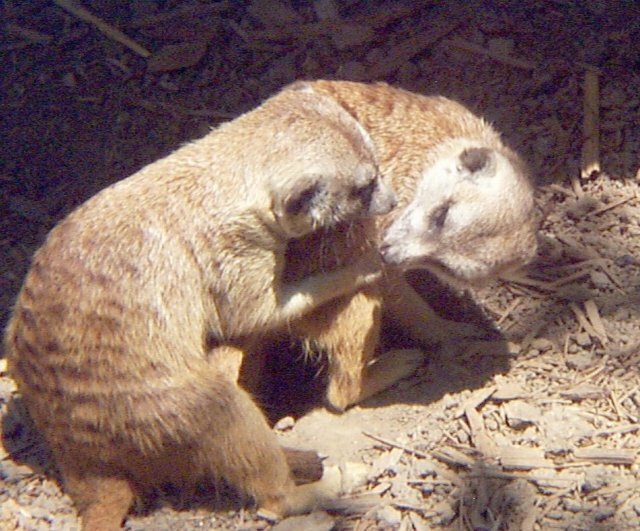 Mating and Maturation: The meerkats become sexually mature at 12 months of age. A particular male and female usually take on the responsibility of most of the breeding. Mating is a little rough. The male pursues the female and then latches on to her neck, after which mating takes place. After a gestation period of approximately 11 weeks, a litter of 3-5 kits is born. They are without hair, helpless, and blind. However, they mature to the point of being weaned within only a month to a month and a halt. At about this same time, they emerge from their den and begin to learn how to capture food. This is done under the watchful eye of the adult babysitter. They are fully grown at 6 months of age, and have a general life expectancy of about 10 years. Comments about the meerkats at the Fort Worth Zoo: The zoo trades meerkats from time to time so that they can mate with others outside of their own family. This is done to prevent too much inter-breeding. In addition, the zoo feeds the meerkats cat chow and crickets. Although very different from their diet in the wild, this type of diet seems to meet their needs. Good news and bad news: Meerkats can be adopted. However, you can not take them home with you. They do not make good pets because of their constant digging and inability to be housebroken. They also do not get along well with other pets and are very likely to bite them. They may even bite you. As you can see from the picture on the left, although meerkats are very cute, they have some serious carnivore teeth! It is best to visit them at the zoo, which is better equipped to do so with properly trained handlers and escape proof facilities. 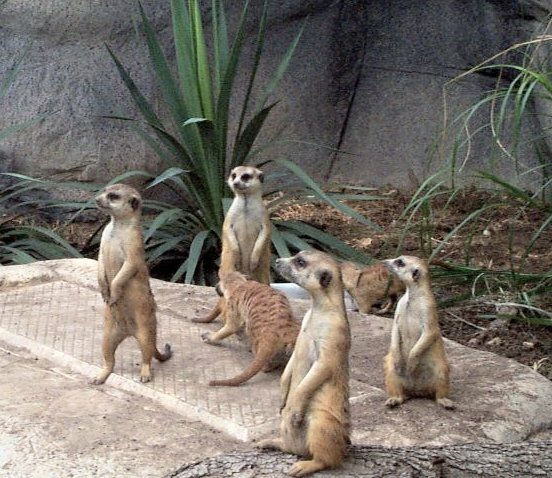 For more information on meerkat adoption, contact Mindia Whittier at the Fort Worth Zoo at (817)-871-7029. Source of information: Fort Worth Zoo 1986 Docent Handbook.